The Woori Yallock Creek sub-catchment has been recognised by all levels of government and the general community for its natural values. The portion of the Catchment in the vicinity of Yellingbo Nature Conservation Reserve (YNCR) that adjoins private landholdings and other bushland remnants on private and public land further upstream are of particular biodiversity significance. The Helmeted Honeyeater, Leadbeater’s Possum and a host of other rare and threatened plants and animals inhabit the remnant bushland in this populated rural area just 50km from Melbourne. Below are a handful of the special species found at Yellingbo. If this whets your appetite… Yellingbo: a special place is a coffee table style book published by the Friends of the Helmeted Honeyeater. It profiles the fauna, flora and history of this very special part of the world. Jason Edwards is the principal photographer. Foreword by John Landy. Yellingbo: a special place can be purchased here. The original inhabitants of Australia have the longest continuing culture in the world, unbroken for more than 50,000 years. The land and everything on it – mountains and valleys, rocks and waterways, everything that grows and everything that lives on it – all this is sacred, belonging to “The Dreaming”. The Dreaming lives on at every level of aboriginal life, passed on from the ancestors to every new generation in art, songs, dances and stories, always old and always new. The Aboriginal people who lived at Yellingbo were the Wurundjeri. This name is derived from their word wurun for Manna Gum and djeri for white wood grub people. Their leaders were the most experienced and intelligent of their group, often great songmen and story-tellers. 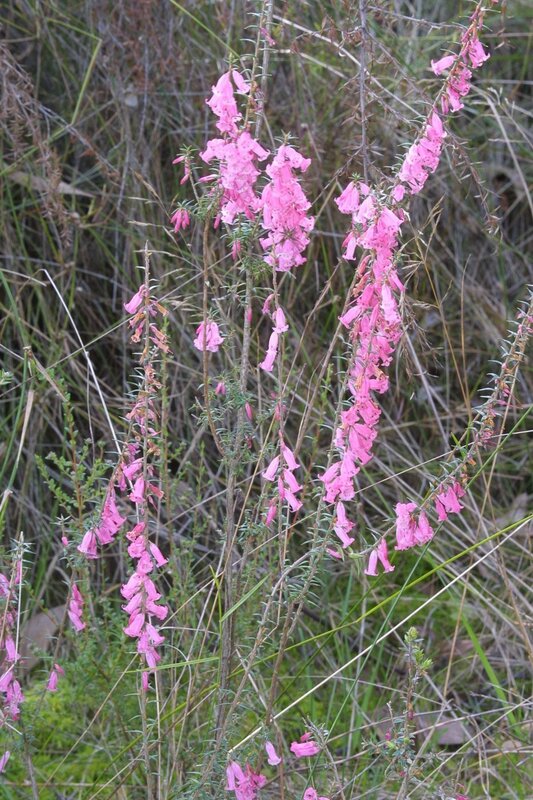 Pink Heath Epacris impressa is Victoria’s floral emblem. Yellingbo Nature Conservation Reserve is the only place in the world where our floral emblem co-exists with our two faunal emblems the Helmeted Honeyeater and Leadbeater’s Possum. FLOWERS: March–November. Masses of white, pink or red flowers. Provides nectar for honeyeaters and insects. You can purchase Epacris impressa from the Friends Indigenous Plant Nursery or help us to grow it by becoming a nursery volunteer. STATUS: The only known occurrence of Sedge-rich Eucalyptus camphora Swamp is within the Yellingbo Nature Conservation Reserve. Sedge-rich Eucalyptus camphora Swamp has been listed as a threatened community under the Flora and Fauna Guarantee Act 1988 (FFG Act). IMPORTANCE: The only known breeding territories of the Helmeted Honeyeater occur within Sedge-rich Eucalyptus camphora Swamp. The endangered Lewin’s Rail Rallus pectoralis and the vulnerable Swamp Skink Egernia coventryi have been recorded within Sedge-rich Eucalyptus camphora Swamp. Other significant records include a large breeding population of Southern Emu-wren Stipiturus malachurus and breeding records of the uncommon Spotless Crake Porzana tabuensis. The conservation of the Sedge-rich Eucalyptus camphora Swamp has the potential to significantly contribute to the conservation of these other species. STATUS: Much of its habitat is either fragmented or greatly altered with the swamps being drained and native grasses cleared since non-indigenous settlement of the land. The Eastern Mourning Skink (Swamp Skink) Lissolepis coventryi is listed as vulnerable in Victoria under the FFG Act. It is one of the many reptile species found in Yellingbo. It was formerly named Egernia coventryi. In 2008 a thorough review of Egernia was undertaken and a subsequent paper published in the Zoological Journal of the Linnean Society. It has split that formerly rather large genus into a few new ones, including Lissolepis. So since then Lissolepis coventryi (after the late John Coventry) is the current name. SIZE: medium sized, up to 100mm long. DESCRIPTION: Back usually olive green, with prominent black stripes along its sides, from shoulder to base of tail. Pale stripe along the upper lip. BREEDING: Mating occurs in October. Being viviparous (producing live young), the Swamp Skink normally has between one and six young (mostly three) in late January or early February. HABITAT: Often restricted to densely vegetated swamps and associated watercourses, and adjacent wet heaths (Melaleuca or Leptospermum thickets), sedge lands and salt marshes. It has a home range of about 10m from its burrow and juveniles disperse up to 200m. STATUS: Green Scentbark Eucalyptus fulgens is not listed as threatened under the FFG Act 1988 or the EPBC Act 1999, but are considered at high risk of decline. On-ground actions that address threatening processes for these species, including habitat quality, predation and competition are considered a funding priority. See the Victorian Investment Framework for Natural Resource Management: Statement of Priorities 2011-12 . It is listed as rare under DSE’s Advisory List of Rare or Threatened Plants in Victoria – 2005. It is one of the many Eucalypt species found in Yellingbo. There are few known populations of E. fulgens in Victoria, most of which are within the Yarra Ranges Council area. Yellingbo Nature Conservation Reserve and its surrounds are a strong hold for this species. DESCRIPTION: Medium tree with coarsely furrowed rough bark to small branches, branchlets smooth. Egg-shaped to elliptic blueish-green juvenile leaves to 7.5cm long x 2cm wide. Adult: long, lance-shaped, glossy green leaves to 18cm long x 1.8cm wide. FLOWERING: Seven clustered funnel-shaped buds with pointed caps. Fruit: cup-shaped, valve slightly protruding. Flowers white flower in January-March. STATUS: The Powerful Owl Ninox strenua is listed as vulnerable in Victoria under the FFG Act. It is one of the many nocturnal birds-of-prey species found in Yellingbo. SIZE: Largest owl found in Australia with an overall length of 60-65cm. The male is larger than the female. DESCRIPTION: Adults are mottled dark grey-brown above and white below with bold grey-brown chevrons (chest barrings); legs are feathered to the tarsus (shins), with dull yellow feet. Immature birds (owlets) are whiter, having paler back and wings, a whiter face with dark eye-patches and sparse fine dark streaks and faint barring on the flanks. WHAT DOES IT SOUND LIKE? A characteristic double-note ‘whooooo-hooooo’, occasionally only a single ‘whoooo’. HABITAT: Generally favours dense gullies for roosting and breeding sites. It prefers older forests where large tree hollows provide nesting sites and arboreal prey items are plentiful. Resident breeding populations are also known to exist in the outer suburbs of Melbourne. BREEDING: Nesting occurs during winter. Usually two eggs are laid in a large hollow. The eggs hatch after 35-38 days and the owlets fledge at approximately 10 weeks of age. The young remain dependent for up to eight months of age. During February and March they disperse and establish new territories of their own. They mate for life. THREATS: The major threat is habitat modification or loss. STATUS: It has declined alarmingly throughout its entire range in the past 15 years, particularly inner Melbourne and NSW. The Growling Grass Frog Litoria raniformis is listed as vulnerable in Australia under the Environment Protection and Biodiversity Conservation Act 1999 (EPBC Act) and vulnerable in Victoria under the FFG Act. It is one of the many frog species found in Yellingbo. SIZE: Large species; males around 65mm long, females up to more than 100mm long. Tadpoles up to 100mm long. HABITAT: Usually found in permanent lagoons, lakes, ponds and dams, especially those with bulrushes and emergent vegetation. THREATS: The threatening processes that are driving the decline of this species are poorly understood, but are likely to include chytridiomycosis (an infectious disease of amphibians) caused by an aquatic fungus and habitat modification or degradation. As a defence mechanism, secretion emitted through glands in the skin can have a toxic effect on other animals, and can cause skin irritation in humans.